Ken and Sonja: Super team couple, married over 30 years, calm energy, adopted baby- now she is 13 years old, whom we are world-schooling by volunteer serving and exploring new horizons. 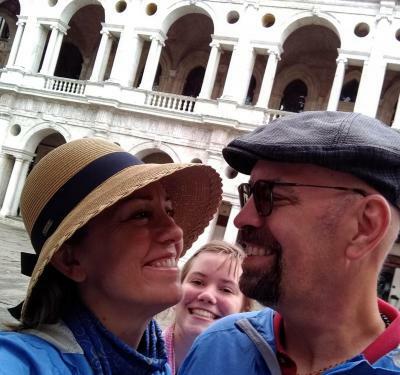 Highlights of our 4 yr travel adventure include house and pet sits all over the US and France and managing BnBs in Hawaii for 18 months as well as a mountain lodge in Costa Rica for 2 months. We left a grown son and lovely home in VA; we have had all sorts of pets and animals through our years. As animal lovers now without pets, we pour our love on those we pet sit for or volunteer at the Humane Society wherever we are. Ken is a master dog walker and I am a cat whisperer, having had cats my whole life. Together we are a great team caring for your pets, physically and intuitively connecting to your pet. We are retired military, non-smokers, gifted in organization. Ken has professional experience as a quality consultant, and Sonja has dental office background where cleanliness is key. We are requested, booked months in advance, and prefer assignments longer than 2 weeks (unless there is no airfare involved.) Look forward to sharing more with you. The Hamner family took care of our house for six weeks. We returned to find everything in good order. The cats were happy, the plants were watered, the mail collected, and the house immaculately clean and tidy. There are a delightful family. We would use them again without hesitation. Karsten hosted us in his newly renovated old Bruchmuhler house, still an ongoing project. He was excited to host our ancestry tour to Gros Benz Prussia/ now Bienice Poland. He secured a car for our use without our request and was eager to translate for us as well. Karsten also borrowed from friends to provide enough bicycles for our whole family to enjoy the area closeby. He had no pets or plants to be cared for, and simply wanted someone to occupy his home while he was away on a fishing trip to Norway. He stated that it would be a good location to sightsee from, and there would not be a need to stay in the home every night. We did stay every night except one when we drove all the way to Gdynia Poland. I stayed the week Ken did Diverbo language week in Laubauch, near Frankfurt. My daughter and I took walks in the meadows, and biked to the grocery store, cooked and kept the home lived in during a time that there were several national holidays and people bustling in the area. Karsten returned on the 8th, saying we could stay as long as we wanted, but we left the next day since we had to get back for a school and job inquiry in NY. We drove first to Hamburg to see the Port of Dreams where my ancestors left from and then down to Ramstein to fly out the very next morning. Karsten welcomed us to come back anytime. We kept Davy the kitty cat happy, safe, and loved on while her owners were wintering on their boat. They returned several times for various appointments and services during the four month housesit. Sometimes we picked up at the airport or did a drop off for them. We left for one of those times to see relatives in another state, but for the most part we were there from Dec 11- April 15th. We cared for the home, the plants, and the kitty, and grew very fond of the owners as well. We kept in contact, sending pictures and giving updates regularly. We stayed upstairs in the guest rooms, with my daughter having her own room. We also gained permission to host my son for the holidays and a friend's daughter who is attending Univ Tenn locally would come over on the weekends. Amy was generous to share her car for us to use locally, and we did drive to the nearby YMCA and library regularly. We met neighbors and took walks regularly in the neighborhood. We had sightings of coyotes and heard it howl at night so we kept the kitty in at night, where there was usually just the freedom for her to come and go through the petdoor. Amy said we could stay forever. We left however to celebrate our daughter's birthday in family in VA, and having met Marlie when volunteering at the Clarity Point memory center, I introduced her as the next sitter. She kept the cat after we left for the Adams anniversary trip. However, we will return for a visit this summer. We cared for the Gould's precious furbabies through Sept 4th and watered their landscaping and houseplants during a hot and dry August. We enjoyed their home and cared for it as our own, while enjoying the nearby park, library, neighborhood gathering, and parade. We took care of cleaning up after ourselves, got the vacuum to work, and caught any critters that the cats brought in. When we left to take a day trip to see the eclipse we communicated with owners and made arrangements, staying in contact with them via email and text throughout our stay. Managing the BnB and taking care of the cats, dog and fruit trees for the owners while they holiday in Japan and Cambodia for June and July. Managed a 7-room bed and breakfast for the owner, who was getting too old for the daily details of running the inn and interacting with guests. Worked for him over a year, until the place sold and the transition began to the new owners. Letter of recommendation available upon request. We stayed most of the month and helped get the second home outside of the city ready for rent in the fall leaf season. We researched and designed the landscaping, built the planter boxes for front porch, transformed the backyard by removing overgrowth and putting in new well placed bushes and perennials while the owner got her son settled in a new school and traveled back and forth from city to town. Watched two Jack Russell Terriers for Rosie and Pedro, Brits who were living in France and visiting Scotland for the summer. Duties included several walks a day, feeding the dogs a special diet, and taking them with us almost wherever we went. Costa Rica: Guest hosts at a remote mountain lodge where we managed the place for the owners while they were back in the states for the holidays. Duties included marketing, booking guests, keeping rooms and grounds clean and presentable, welcoming guests, feeding guests, taking guests on tours, managing all the money, buying supplies and paying the employees for Scott, 011-506-8646-2443. Massachusetts: Historical home. Cooking, seasonal cleaning, organizing, touch-up painting, landscaping, gardening, installing shelves & lights and windows and siding, as well as house and dog sitting for Wendyll, a breeder dealing with dogs in heat, etc, 781-254-9941. Prince Edward Island: Rural home of entrepreneurs. Insulation and drywall in new kitchen/living room, scraping and priming one of their business buildings, mowing, weeding, tree trimming, house sitting and care for elderly mothers while hosts were away. Also, plenty of cooking, cleaning, dish washing and gardening for Neal and Helen, 902-626-9996.